Indonesia’s digital trade is expected to be the biggest support for the country’s economy by 2030, by helping commodities and manufacturing goods as well as services gain greater online market access. The research was jointly conducted by AlphaBeta, the Hinrich Foundation and the Centre for Strategic and International Studies (CSIS), titled the Digital Komodo Dragon: How Indonesia can capture digital trade opportunity at home and abroad. The research shows that digital trade could create opportunity worth Rp 2.3 quadrillion (US$172 billion) for the domestic economy alone by 2030, equivalent to 9 percent of Indonesia’s projected gross domestic product, from only Rp 125 trillion by 2017. The sectors that can benefit from digital trade include agriculture and food, education and training, consumer and retail, infrastructure, resources, financial services, manufacturing and health. Digital exports are also expected to grow by 768 percent to Rp 240 trillion by 2030 from Rp 28 trillion in 2017, if Indonesia and its trade partners are willing to reduce trade barriers related to digital trade. 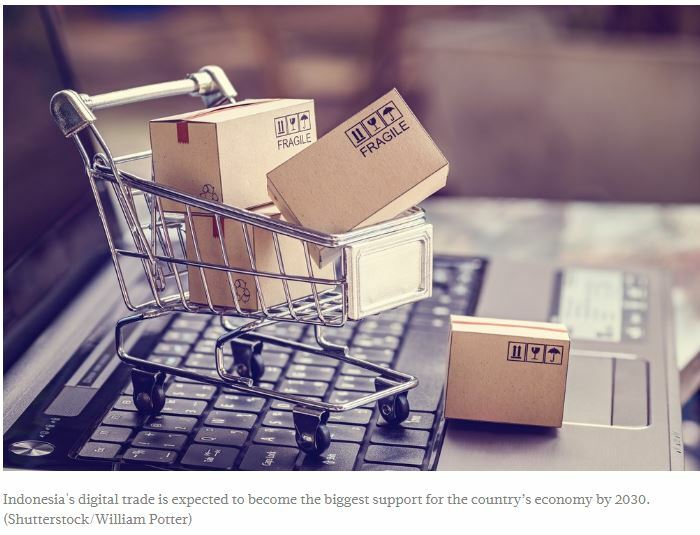 “Digital trade could help businesses […] identify and enter new markets easily,” AlphaBeta associate Genevieve Lim said during the report’s release on Tuesday.